With the election only a week away, large numbers of youth are leaving the Valley for their homes. The long lines at ticket counters and crowds waiting for village-bound buses suggest young Nepalis are excited about this election. Nepal has not had an election for nine years, and more than 22 percent of the listed voters will be voting for the first time. The direction of the country will be decided by those younger than 35, who form 51 percent of the total electorate. Although more than 50 percent of the voters are 'young', youth representation amongst election candidates is dismal. 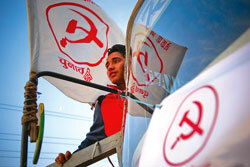 In the FPTP ballot, the UML, NC and Maoists have nine, four and 96 candidates below the age of 36 respectively. Can we trust the same old faces to forge a new road for young Nepal? Raju Thapa, an undergraduate student says, "the older politicians might have more seats because they are more experienced. If they have understood the people's desires and adopted modern ideology, we can still expect change." Talking to Nepali Times, Pradip Poudel, chairman of the NC-affiliated Nepal Students Union said: "we are not satisfied with the way our party has selected its candidates but we do still support the party since it has included our agenda for republicanism and federalism in its election manifesto. Right now we are 100 percent behind our leadership but if they shy away from fulfilling the people's mandate, we won't be silent spectators." In a recent press briefing, the election commission stated that 22 candidates under PR were below the required age of 25. Youth leader Amrita Thapa of the CPN-Maoist said: "We had to reject a lot of qualified candidates who applied for the PR list because of their age. The youth are dynamic and have an important role in bringing about change. Age should not be a barrier for candidates who are qualified otherwise." Although there is no strict provision for the inclusion of the youth in the CA polls, there are at least some candidates who can be considered young. While they are not proportional to their contingent of the population, it is a start.